The Monarch butterfly is perhaps one of the most iconic insects on Earth, says wildlife expert Phillip Elden. However, these beautiful signals of summer are dwindling at an alarming rate. Here, Elden answers common questions about the Monarch. 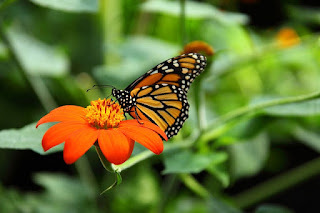 Q: Where do Monarch butterflies live? Phillip Elden: The Monarch is common in 49 US states – Alaska the only exclusion. It is also widespread throughout South America and along the coasts of Australia. Interestingly, the North American Monarch makes the longest migration of any butterfly we know of, traveling up to 3,000 miles at the onset of cold weather to finish out the winter, and its life, in California and Mexico. Returning butterflies are the grandchildren and great-grandchildren of those whom made the trip the previous year. Q: What do Monarch butterflies eat? Phillip Elden: Both larvae and adult Monarch butterflies dine almost exclusively on the milkweed plant. When milkweed is unavailable, the adult butterflies can eat nectar from a number of other flowering plants, including clover and sunflower. Larvae cannot survive without milkweed. Q: When do larvae turn into butterflies? Phillip Elden: Monarch butterflies only have a lifespan of around seven months, so shortly after birth, and once they have fattened up on milkweed nectar, Monarch larvae develop a protective covering, known as a chrysalis. While wrapped up in the chrysalis, the larva transforms into pupa and emerges a few weeks later as the grand Monarch. Q: How are scientist trying to gain a better understanding of the Monarch? Phillip Elden: Over the last decade, the population of Monarch butterflies wintering east of the Rockies has declined rapidly. The causes are many but include the decimation of milkweed from the landscape as well as a number of natural disasters in Mexico and California. Researchers have studied weather patterns and other factors to better understand what we can do to ensure the Monarch doesn’t eventually die out.